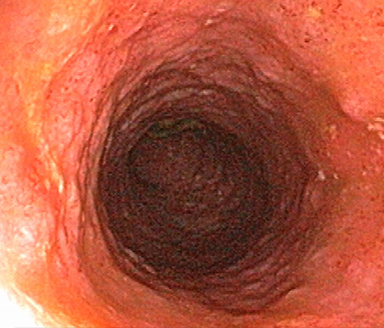 Images are representations of endoscopy subscores, not of actual patients studied in the PURSUIT trial. *See complete study design for endpoint definitions and trial details. PURSUIT: Subcutaneous golimumab induces clinical response and remission in patients with moderate-to-severe ulcerative colitis. PURSUIT: Subcutaneous golimumab maintains clinical response in patients with moderate-to-severe ulcerative colitis. PURSUIT=Program of Ulcerative Colitis Research Studies Utilizing an Investigational Treatment. OBJECTIVE: To evaluate the safety and efficacy of SIMPONI® (golimumab) in a Phase 2 and Phase 3 trial (N=761), designed as a randomized, dose-finding, double-blind, placebo-controlled, multicenter trial conducted in patients with moderately to severely active ulcerative colitis who had an inadequate response or were intolerant to conventional therapy. INCLUSION CRITERIA: Patients presented with a Mayo score between 6 and 12, and an endoscopic subscore of ≥2, and had failed or were intolerant of oral corticosteroids, oral 5-aminosalicylates (5-ASA ), 6-mercaptopurine (6-MP), or azathioprine (AZA), or were corticosteroid dependent. TREATMENT REGIMEN: Patients were randomized and treated to the following at Weeks 0 and 2, respectively: SIMPONI® 100 mg to 50 mg, SIMPONI® 200 mg to 100 mg, SIMPONI® 400 mg to 200 mg, or placebo. EFFICACY ENDPOINTS: Primary endpoint was clinical response at Week 6. Clinical response was defined as a decrease from baseline in the Mayo score of ≥30% and ≥3 points, accompanied by a decrease in the rectal bleeding subscore of ≥1 or a rectal bleeding subscore of 0 or 1. 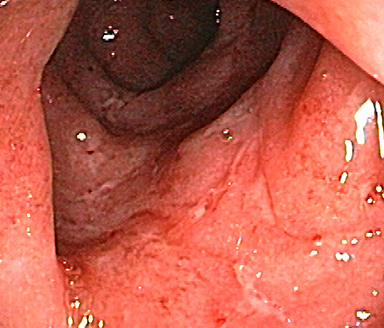 Secondary endpoints included remission and endoscopic improvement of the mucosa at Week 6 (with a Mayo endoscopic subscore of 0 or 1). Final efficacy evaluations were completed at Week 6. 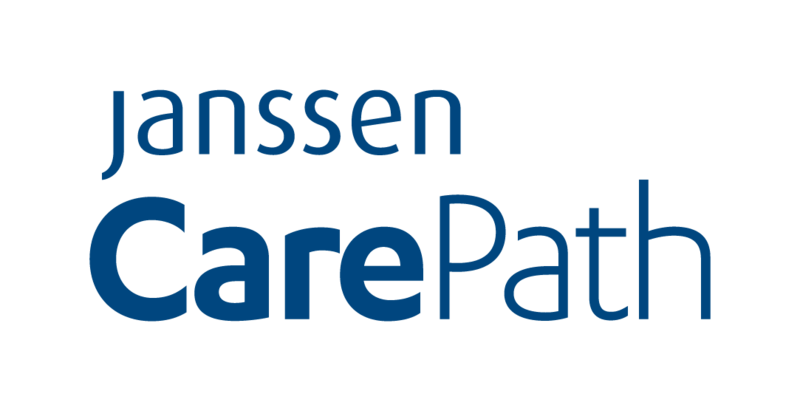 OBJECTIVE: To evaluate the long-term safety and efficacy of SIMPONI® (N=456) through Week 54 in a Phase 3, randomized, double-blind, multicenter withdrawal study. INCLUSION CRITERION: Patients must have demonstrated clinical response to SIMPONI® in the PURSUIT induction study. 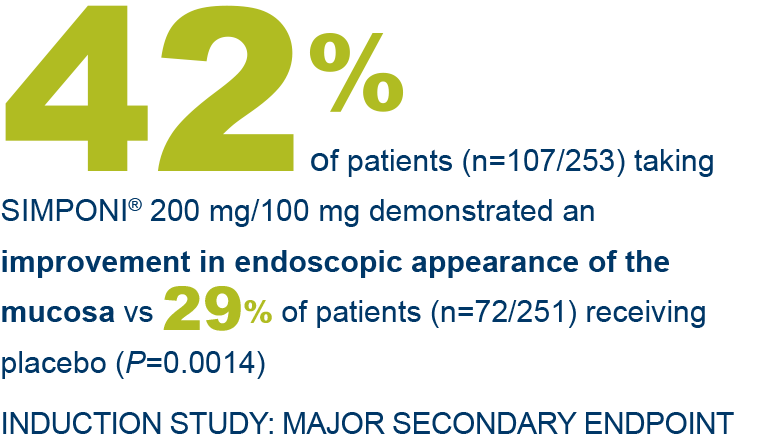 TREATMENT REGIMEN: Patients were randomized to receive SIMPONI® 50 mg, SIMPONI® 100 mg, or placebo, administered subcutaneously every 4 weeks. 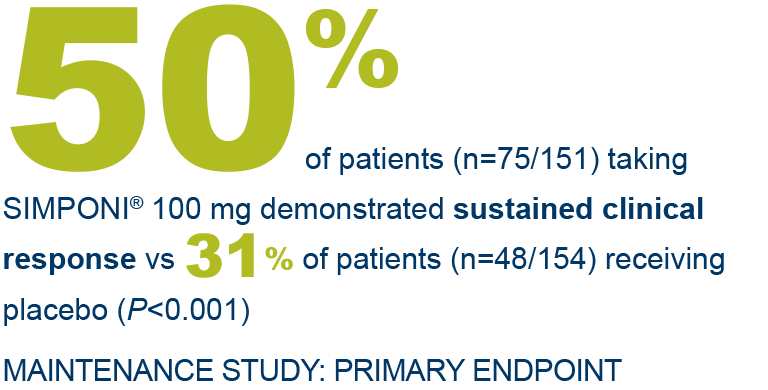 EFFICACY ENDPOINTS: Primary endpoint was maintenance of clinical response through Week 54. Patients were assessed for UC disease activity based on partial Mayo score every 4 weeks; loss of response was confirmed by endoscopy. 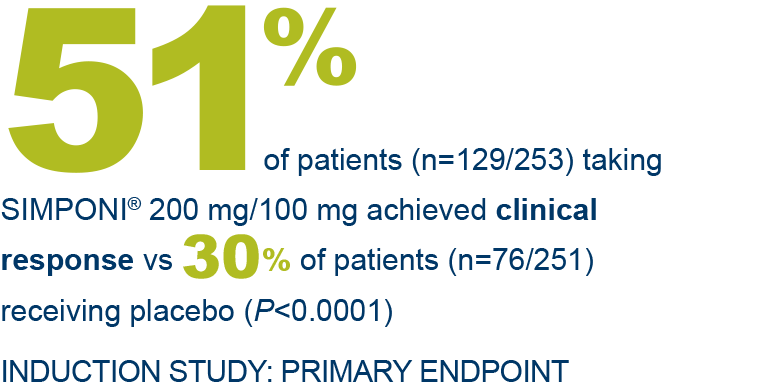 Patients had to maintain clinical response at every evaluation through Week 54 without demonstrating loss of response at any point to be considered in response in the SIMPONI® 100-mg group compared with the placebo group. Secondary endpoint was clinical remission at Week 30 and Week 54. Both studies permitted concomitant treatment with stable doses of 5-ASA, corticosteroids, and/or immunomodulators. However, corticosteroids were to be tapered at the start of the maintenance study in patients in clinical response at Week 6. References: 1. SIMPONI® (golimumab) Prescribing Information. Janssen Biotech, Inc. 2. Sandborn WJ, Feagan BG, Marano C, et al; PURSUIT-SC Study Group. Subcutaneous golimumab induces clinical response and remission in patients with moderate-to-severe ulcerative colitis. Gastroenterology. 2014;146:85-95. 3. Sandborn WJ, Feagan BG, Marano C, et al; PURSUIT-Maintenance Study Group. 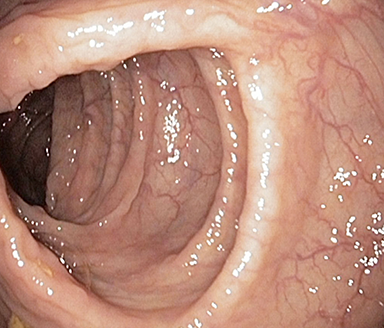 Subcutaneous golimumab maintains clinical response in patients with moderate-to-severe ulcerative colitis. Gastroenterology. 2014;146:96-109.